Eugene Matthew O’Brien is among those obscure Civil War multitudes whose collective stories inspire for their courage, dedication, and sacrifice even if we know little about them individually—although his story is a bit unusual. O’Brien was a steam engineer who fought the entire war on the vast oceans of the world aboard the first (CSS Sumter), the most famous (CSS Alabama), and the last (CSS Shenandoah) of the Confederate commerce raiders. He sailed farther and served longer at sea than any man on either side. As can be judged by results, his services—from Sumter third assistant engineer to Shenandoah chief engineer—were crucial to the notable successes of these renowned vessels. Confederates applied the latest industrial technologies to advance ancient concepts of commerce warfare at sea while the U.S. Navy struggled to combat them. Rebel raiders wreaked havoc on powerful Union shipping and whaling industries, disrupted economies foreign and domestic, exacerbated international tensions, diverted critical resources, impacted home-front morale, and seriously threatened the Union war effort. Combining the advantages of fast sail with steam propulsion, these vessels were prototypes of cruisers to follow and exemplars for raiders stalking the oceans through the world wars. It was a watery form of guerilla warfare in the spirit of John Mosby and Bedford Forrest with a bit of W.T. Sherman. O’Brien was born in County Limerick, Ireland in 1837, and immigrated to this country at age six with his parents, ending up in New Orleans. Starting in 1852, he apprenticed in the machine shop at Leed’s foundry. O’Brien joined the Confederate States Navy on May 20, 1861, and was assigned to Sumter. Captain Raphael Semmes would go on to command Alabama, becoming the Confederacy’s most famous sailor. But Sumter was a small, slow merchant steamer, ill-suited for long-distance cruising, one of the few vessels available for purchase and conversion to a warship. Slipping past New Orleans blockaders in June, Sumter captured eighteen Unites States flag vessels in the Caribbean and South Atlantic until trapped at Gibraltar in April 1862 by Union warships and deteriorating engineering problems. Keeping her going without access to industrial repair facilities had become increasingly difficult. O’Brien followed Semmes to Alabama, the first warship built from the keel up solely for commerce raiding—small but sustainable for long cruises, light, fast, and lightly armed. From August 1862 to June 1864, she completed the most dramatic and destructive cruise of the war, claiming sixty-five prizes valued at nearly $6,000,000 and ranging as far as the South China Sea. The USS Kearsarge sank Alabama off Cherbourg only after she was too tired to continue. “O’Brien’s skill and resource were very unusual, even in the line to which officers of his grade are most carefully trained,” wrote Lieutenant Arthur Sinclair of Alabama. They cruised for two years without access to machine shops and dockyards; at the end, her machinery was in excellent condition and her boilers still available. During the climatic fight with Kearsarge, O’Brien was wounded as an 11-inch shell pierced the waterline amidships, blasted through the coal bunker, and exploded in and destroyed the engine room; it was the death blow for Alabama. 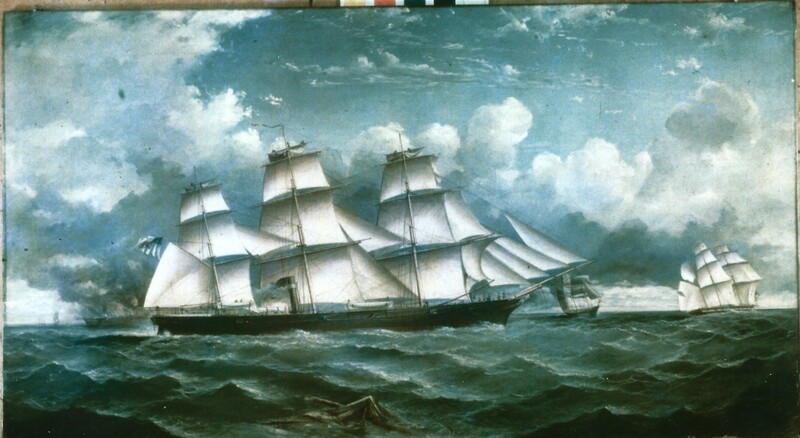 O’brien was pulled from the water with his captain by the English yacht Deerhound and was available when called to serve as chief engineer on Shenandoah. O’Brien’s mechanical and personal skills would be seriously challenged on that cruise also. Shenandoah was a British clipper ship with a steam engine built in Glasgow in 1863 for the China tea trade. The Confederates purchased the vessel, strengthened the decks, and added guns. From October 1864 to November 1865, Shenandoah carried the conflict to the ends of the earth through every extreme of sea and storm. She invaded the north, the deep cold of the Bering Sea, fired the last gun of the conflict and set crystal waters aglow with flaming Yankee whalers. In November 1865, seven months after Appomattox, Shenandoah completed her circumnavigation of the globe and limped into Liverpool. Captain Waddell lowered the last Confederate banner without defeat or surrender. After three and a half years afloat, Engineer O’Brien went ashore with his fellow officers to reconstitute their lives. Mid-nineteenth-century America was on a cusp between ancient and new, known and unknown, natural and manufactured; Sumter, Alabama, and Shenandoah exemplified these momentous transformations. In a few decades, natural elements of wood, hemp, and canvas would give way to forged and manufactured materials of iron and steel. The siren call of wind in the rigging was silenced by the thump of the engines and the roar of mechanical blowers; the fragrance of the sea was tainted by coal smoke. Expertise required to sail a wooden square rigger would become archaic and nearly superfluous while the new profession of marine engineer foreshadowed the machine age that followed. The juxtaposition of these disparate elements was characteristic of our Civil War. The Confederate navy (like the army) was blessed with many good line officers, mostly veterans of the U.S. Navy, but was not so fortunate in steam engineers—a comparatively new field, its status not well defined. Sailors were generalists, expected to perform almost any function in the millenniums-old technology of wind propulsion. Their attention was always upward and outward to the infinity of sea and sky, their skills more a matter of instinct and experience than detailed technical understanding. A seaman’s purpose was to harness impersonal natural forces, turning them to purposeful motion—or frequently just surviving them. Sea officers appreciated the advantages of steam propulsion but did not always welcome the noise, the dirt, the smells, and disruption of the natural environment of sail. Denizens of the engine and boiler spaces, however, were technical specialists who shared little in the way of knowledge, skills, or sensibilities with those above; their focus was entirely inward. Navy engineers designed, acquired, installed, operated, and maintained steam machinery both ashore and afloat. A ship’s chief engineer ranked as a commissioned officer; first, second, and third assistant engineers were warrant officers. The Confederate Navy was severely handicapped by lack of this expertise; most of the engineers they did have were civilians and northerners or foreigners. Engineering spaces usually occupied the entire middle section of a vessel from main deck to keel, areas formerly reserved for cargo and stowage. This dusky domain bore little relationship to life topside except for almost constant motion. Shut off in the bowels of the ship, it was a claustrophobic den of dust, darkness, and fire, intense heat and noise, smells of iron, steel, oil, coal, and sweat. The steam engine is a whirring, huffing, puffing, hissing, clanking, slick and oily, clamorous monster with blindingly fast wheels, gears, shafts, and rods surrounded by imperfectly insulated scalding hot water and steam pipes, not to mention intense boiler fires. It is an encapsulated environment of impersonal, raw, self-generated power—exemplifying humanity’s increasing dominance over nature—and a dangerous and unpleasant place to work. This was the world of Eugene Matthew O’Brien. He and his fellow engineers played vital roles in Sumter, Alabama, and Shenandoah, and in all steam vessels on both sides. O’Brien returned to New Orleans and entered the employ of the Morgan Steamship Line, eventually becoming the federal district inspector of steam vessels. Arthur Sinclair, Two Years on the Alabama [annotated] (Kindle Edition), Location 4129. This entry was posted in Navies, Personalities and tagged blockade, Commerce Raider, Confederate Navy, CSS Alabama, CSS Shenandoah, CSS Sumter, engineer, Eugene Matthew O'Brien, favorite17, James Waddell, Raphael Semmes, steam engineer, steam technology, steam vessels, USS Kearsarge. Bookmark the permalink. Thanks, Dwight S. Hughes, you make the history come alive for us! Good wishes. That is the best compliment you could have made. Thanks! Interesting piece ! Thanks for posting. Here is a good example of Confederate sailors who were repeatedly shuffled around onto different ships in Europe. Good insight.